"Faneuil Hall Boston, the Cradle of Liberty, has a greater historical interest than any other building in the United States, save Independence Hall in Philadelphia. It was built at the expense of Peter Faneuil, a wealthy merchant of French descent, and given by him to the town. 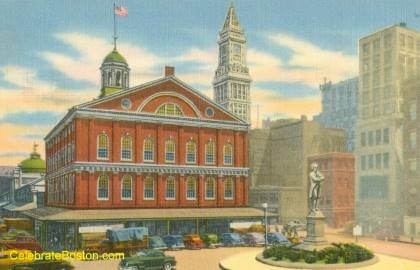 The building was completed in September 1742, with the people voting that it be called 'Faneuil Hall' forever. On March 3, 1748, Faneuil died, and the first public gathering in the new hall was on the occasion of the eulogy of him on March 14th 1748. Faneuil was buried in the Granary Burying Ground. The building was almost destroyed by fire on January 18, 1761. It was re-built, with the funds being in part raised by a lottery authorized by the state. The lottery tickets bore the ample signature of John Hancock. When re-opened on March 14, 1763, James Otis, Jr. delivered an address dedicating the hall in the cause of liberty, and so it has been ever called the Cradle of Liberty. In 1805, the building was considerably enlarged. In 1772, the first Committee of Correspondence was established here by a motion by Samuel Adams, and contained the premises of the Revolution, which Loyalists of that time state to be the origin of the rebellion. 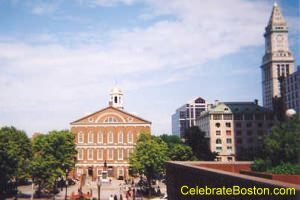 On November 29, 1773, the first meeting in protest of the imposed tea tax took place at Faneuil Hall. A vote was taken, and it was resolved that ‘as the town of Boston, in a full legal meeting, has resolved to do the utmost in its power to prevent the landing of the tea.’ Because of limited space for the crowds, meetings were often moved to the Old South Meeting House. During the occupation of Boston in 1774, the hall was used as a theater for British officers. The gilded grasshopper—the weathervane upon the cupola of the building—is said to been selected to imitate the one upon the pinnacle of the Royal Exchange in London. Just past Faneuil Hall along the Freedom Trail is Mayor Curley Park, the Holocaust Memorial, Ebenezer Hancock House, and the Boston Stone. A statue of Samuel Adams is located on the Congress Street side of Faneuil Hall. Walking Directions: Exit the station and walk north up Congress Street. Faneuil Hall will be visible on the right. There are two entrances on each end of the building. Quincy Market is just behind the building. From Government Center Station on the Green & Blue Lines, exit the station and walk straight ahead across the brick plaza. Stay to the right of City Hall, and Faneuil Hall is across Congress Street.